Sheena Croft, the Executive Chef and native of the South Georgia and North Florida area, uses her Southern Heritage to bring you what has been called "Upscale Comfort" food. Hannah's restaurant enjoys working with local farmers, ranchers and businesses, to bring you the best of our bountiful area in North Texas. Fresh locally pastured chicken and eggs, Farmers Market Vegetables, recyclable to-go boxes and a rotating seasonal menu are just a few of the ways we strive to meet our community's expectations. We are honored to be showcasing more and more of these items on our everyday menu as the Seasons progress. 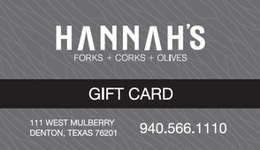 For balance inquiries call the phone number to a Hannah's Off The Square's location below.